For the last two winters, I’ve really enjoyed having Ginger Syrup in my refrigerator. It makes the perfect ingredient for all kinds of lovely wintry dishes, from cocktails to marinades. I learned about it from an episode of Simply Ming on PBS and got the recipe from that website, Episode 715: Ginger Syrup. The recipe suggests drying the strips of ginger after they are removed from the syrup in a slow oven. On the accompanying television show, he suggested simply leaving them out overnight, which is what I do. The ginger strips that are the by-product of this recipe have little in common with candied or crystallized ginger that you may have bought or made from other recipes. It would be cruel to hand one of these to a child and tell her it’s candy. These have only a trace of sweetness but attack with a bold spiciness — think red hots only with gingery heat instead of cinnamony heat. These strips are sticky and, occasionally, you’ll come across one where the fibrous portion just won’t be chewed and you have to spit out the stringy wad. Why bother? These are my secret weapon against nighttime snacking–a few of these strips and I am completely satisfied, with freshened breath and settled stomach. Watch this space. Next week I will use the ginger syrup to make two of my favorite salad dressings. (Edited to add: Two Ginger Salad Dressings). Check the Weekend Cooking post at Beth Fish Reads for more recipes, book reviews, and culinary exploits. I never heard of ginger syrup. But I love crystallized ginger for snacking. I should look into this (even though it’s not sweet). I love the zing of ginger! This is completely new to me. I can’t wait to find out how to make the syrup and this bi-product. I like the taste of fresh ginger so I’m sure I’ll like this version. Interesting! I’m pretty addicted to these little ginger chews you get at Asian stores… Also “Simply Ming” on PBS? Never heard of it. But thanks for the hot tip – I will check it out! 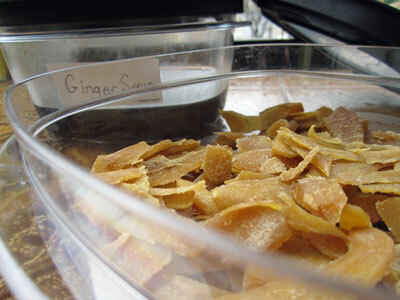 I have a jar of candied ginger but not homemade, what a great idea! I love that sweet bite it has. I love Ming! He’s cute when he has his parents on. I’ve never heard of ginger syrup, so I’m off to do some investigating. Can’t wait to see what you post next week! One of the first cooking DVD sets my husband and I bought was a series of Simply Ming recipes – great shows. We’ll have to give this ginger syrup/strips recipe a try. I really liked Simply Ming but missed this episode entirely. Drat. I just came back from the store. Now I’m going to have add lots of ginger to my shopping list next week. Can’t wait to see your ginger recipes. I adore ginger. I haven’ heard of either… but worth checking out as I love ginger. Hmm, I happen to have some fresh ginger in the house. I’m definitely going to check these out. I love ginger. I love ginger and could probably eat those ginger strips like candy even though they’re nowhere near as sweet as crystallized ginger. I eat all the pickled ginger that comes with sushi… from everyone’s plate at our table! LOL! Oh that sounds great! I’m lazy though: I buy my ginger syrup… :\ Can’t wait for your dressing now!